The Wellesley Service League welcomes new member candidates who are willing to give enthusiastic support to the program of community service sponsored by the League. Our organization maintains a total membership of between 75-80 Provisional and Active members for each service year. In addition to fulfilling the mission of the League by providing volunteer services, each member has an opportunity to make meaningful friendships with a diverse group of women. Membership in the Wellesley Service League is based on sponsorship, particularly because we want to be sure you understand the mission, services, hour requirements, and financial obligations of the League before making the commitment to join. You will need to secure a sponsor to usher your application through the process and ask them to submit your name. The number of new members varies depending on how many people rotate out of their years of service, and we do keep a waiting list. If you are interested in discussing prospective membership, please contact the WSL Membership representative at secWSL@gmail.com. • Obtain a sponsor who is an Active, Provisional or Sustaining Member of the League. • Reach your 25th birthday by the final date for submitting completed applications. • Have resided in Wellesley for at least 12 months by the time your membership begins, or be known by a sponsor for at least 12 months prior to the application deadline. 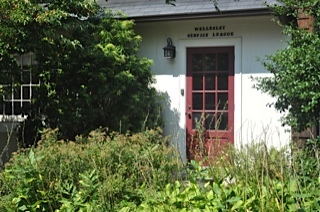 • The primary purpose of Wellesley Service League is to provide service to the Wellesley Community. A five-year commitment is expected of all members. • Attendance at monthly Barn meetings is required. These are generally held the first or second Friday of each month, September through June. Attendance is also required at the Annual Meeting in June. Illness and travel are the only absences excused. • All members are assessed annual dues of $85, plus the annual meeting fee of $35. • In the event a member is unable to fulfill a service commitment due to a conflict, that member is required to find her own substitute. • Provisionals are required to attend Provisional Orientation Week in September. • Provisionals are required to commit a minimum amount of hours to each board of the Wellesley Service League the first year to become acquainted with all services. • Provisionals give a luncheon/tea in May for the Friendship Circle ladies and a coffee/tea in September following their Provisional year for the new Provisional Class. • All members must abide by the By-Laws and Rules.